What Now: To The States! Washington DC is lost, in every way that matters. there’s little to gained now from paying it any attention. The path forward has to be at the state and local level – and not only are we poised for success, we are having success. First we do need to acknowledge that Progressive efforts to make these United States into one democratic nation ruled from Washington have been quite successful. The change of our educational, cultural, and religious institutions has certainly worked. It took a long time to get here, it will take a long time to get back. Realize it, accept it, and then be free to figure out how to make things the best they can be each step of the way on the way back. 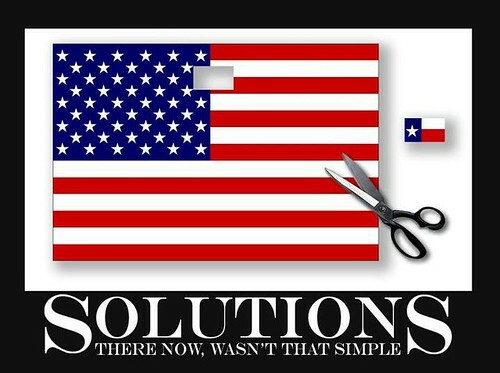 NOT Secession, just a change in FOCUS! This nation works best when it’s a Democratic Republic of 50 states joined together. Fifty shades of Red, White, and Blue. Copenhagen doesn’t know what’s best for Madrid any better than NYC knows what’s best for Houston. The election in November was an attempt to have folks in DC who understood that, and who would support the concept of releasing some power and control back to the states. That failed, so the job of taking power and control back will be a bit harder. That’s all. It’s not the end of the world. So – reality accepted, task understood. The problem is that it’s so much easier to talk about national stuff, that’s what they talk about on the news, and since my social network of friends is all over the place, that’s the political stuff we have in common. All this “work locally” junk means that my social network is useless and I have to abandon my friends and go out in the real world. Definitely not, and probably not. The great thing about social networks, is that we can share success and ideas, regardless of location. Success with the union stuff in Wisconsin helps the folks fighting that fight in Michigan. What someone learns from a school board meeting in Boca Raton can help the person at the Water District meeting in Topeka. Each one of us can act locally, but with the knowledge and experience of friends all over the nation. THAT can help us win. That’s where we have to win. Progressives overreach, and the people don’t like that. Just because Progressivism is everywhere and it’s what the cool kids are doing, and they want to rule the world doesn’t mean they’ve won. It just means that people have been snowed. Progessivism seems great when it’s at medium, or even medium-high, it’s a nice warm feeling. Turn it up to high and people realize they are about to boil, and they jump out of the pot. BE THERE with a solution. The folks in MI were there with a solution, and they won. FACTS drive public policy, eventually. The people may vote, and the elected officials may make laws based on airy-fairy assumptions, hopes and wishes. But when reality happens, those same people will scramble to fix it. We see it nationally on the crap that they’re now trying to halt or turn around from Obamacare. It happens at state and local level as well. BE THERE with the recommendation, the repeal of the law, the countervailing policy, the local candidate who will do something different. There are state and local think tanks and other organizations ready to jump in. Pick your pet issue, and go for it – locally. The great news is that the more local you get, the faster and easier you can have an impact. I haven’t figured it out myself yet either, I haven’t picked a pet issue, I’m still trying to not be dejected and depressed. I’m still trying to decide how to leverage my wonderful G+ friends into action and success for the future. But…I’m beginning to see not just the GOAL, but a bit of the STRATEGY that I want to adopt. What’s the area that would have the best/fastest impact? Taxes? Spending? Regulations? What’s the structure to target first? Neighborhood association? Water District? School District? City Council? State legislature? What examples of success can we draw from? Is it best to work around governmental entities entirely and focus on churches, charities, business groups, etc to increase the positive outcomes from them rather than to decrease the negative impact from the other guys?